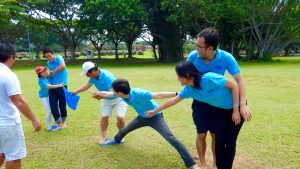 One of the newest activities to hit our corporate clients, the running man team building session is fun and yet effective in teambuilding. Like the Korean TV show, participants will be grouped together performing crazy antics and team building tasks at the same time, unlike your typical amazing race session time is not of essence but the quality and quantity of the stations that matters. Station games like the infamous name tag ripping, Frisbee catching, egg mania are just a few of the popular ones amongst our clients. Contact us for more information with regards to how we can make your running man session unique for your company.